Segundo ano de Frames Portuguese Film Festival e segundo ano em que o À pala de Walsh se junta a esta iniciativa dirigida por Fernanda Torre e por Carlos Pereira. A programação deste ano estará subordinada ao tema da memória: “O que é a memória? O que é que o acto de recordar implica? Como é que nos podemos relacionar com o passado de uma maneira individual e colectiva?”. As perguntas começam a ser respondidas nas projecções de algum do melhor cinema feito em Portugal. Desta vez, o festival não se limita à cidade de Estocolmo (24 a 29 de Novembro). Västerås (1 de Dezembro) e Gotemburgo (4 a 6 de Dezembro) recebem também o Frames. O À pala de Walsh mostra-se de novo grato pelo desafio de participar na redacção das folhas de sala, especialmente ao programador Carlos Pereira. Agradecemos ainda à Vera Salgado Guita, pela inestimável colaboração na revisão dos textos. Desejamos a todos os espectadores suecos um excelente festival. Trevliga föreställningar! Second year of Frames Portuguese Film Festival and second year where À pala de Walsh joins forces with this initiative lead by Fernanda Torre and Carlos Pereira. This year program deals with the theme of memory: “What is memory? What does the act of remembering entail? How do we relate to our past in individual and collective ways?”. The answers to these questions will start during the screening of some of the best cinema made in Portugal. This time the festival will not be staying only in Stockholm (24 until 29 of November). Västerås (the 1st of December) and Gothenburg (4 until 6 of December) will also receive Frames. À pala de Walsh is again grateful for the challenge of participating in the writing of the articles on the films being shown. We would like to thank especially the film programmer Carlos Pereira. We also thank Vera Salgado Guita for her priceless support in proof reading these reviews. We wish to all sweddish moviegoers an excellent festival. Trevliga föreställningar! At least since the 1960s there’s been an intense debate on why the Portuguese don’t watch Portuguese films. Many people say that it’s because most filmmakers don’t care about the spectators and only make films to please themselves and those close to them – other filmmakers and artists. It is thus said that the problem lies in the veering of Portuguese cinema to auterism. Although this may be true, the fact is that, with few exceptions, even those movies that try to reach the masses, so to speak, don’t sell that many tickets. Even more remarkable about cinema in Portugal is that almost no one has tried to arrive to some middle ground between artistic integrity and box-office success. That’s the reason why a film like Alice (2005) was such a surprise: it was critically acclaimed and a festival darling – it won awards at Cannes and Berlin – but also a (mild) hit by Portuguese standards – more than 30.000 went to see it. And why it was such an oddity: almost ten years later, maybe just two or three other movies have achieved something similar and none exactly the same. Alice shares some of the traits for which Portuguese movies are known (by a few people around the world), the emphasis on cinematography (composition, light, mood, tone) being one, which is not surprising since director Marco Martins is also a photographer. However what makes it unusual is its reliance on the narrative. It’s obviously not an action movie or anything of the sort, but seldom a protagonist in a Portuguese film has had such a clear and urgent goal, ultimately leading the whole movie. Mário’s obsessive search for his missing daughter (Alice, whom we never see, or do we?) is the structure where everything else hangs and it is strong enough to hold everything together. You can even say that Alice is a character study of a man (played by Nuno Lopes, catatonic and explosive all at once) on the verge of losing his mind and all that he has left – his wife (Beatriz Batarda, always slightly out-of-focus, out of his thoughts, out of the film itself), his job, his friends – because he can’t let go. His suffering is understandable and very relatable – everyone will be thinking what would one do in his situation -, Alice has only been missing for about six months after all. Still there’s something frightful about his quest: maybe it’s his quietude amidst it all, the way he mindlessly delivers flyers with the child’s face in train stations and busy streets; his absurd routine of retracing every step he took the day she went missing; the fact that he has cameras scattered all over town; or just the way you feel that it’s all hopeless and he’s only making it worse. However, that’s not all that interests Martins. You can even sense that this could have made an entirely different film (one more in tone with other Portuguese movies?). As mentioned before, Mário has various cameras spread all over Lisbon and he watches the images recorded by those at home, in the dark, every night, in a dozen TV sets. Then there are the surveillance cameras at the airport and at train stations that he gets to watch, after he somehow made acquaintance with those who manage them (Gonçalo Waddington plays an assistant camera who used to work in soap operas and now is monitoring the cameras at the airport and making up stories for everyone he sees). This theme of recording everyday life through cameras, clearly dear to Martins, makes itself even more noticeable when some establishing shots start resembling surveillance cameras, which is not exactly subtle and feels unnecessary to the rest of the film. Fortunately, that doesn’t take much from some other very interesting things in Alice, such as the way Martins films Lisbon, unlike anyone else as done before. Usually shot bright and sunny, filled with quaint, old little streets and buildings, the “white city” as Alain Tanner named it (and the film he made here), Martins’ Lisbon is sad, rainy, moody, modern, ugly, and blue. It’s a “blue(‘s) city”, which matches the psychological state of the protagonist (and the coat Alice was wearing when she was last seen). Something else that helps creating this sense of dread that pervades through Alice is the music written and recorded by the late Bernardo Sassetti, haunting, beautiful, as repetitive as Mário’s actions. Repetition is of course the motif of the whole film, as well as it seems almost timeless. Since Mário’s days are rather the same, you never know exactly where you are, which day is it, how long has it been since it all started. Halfway through the movie there’s a flashback to the day Alice disappeared, which explores this uncertainty even further – Are you moving backwards? Has this happened again? Has this happened before? Will it keep happening? Does Mário have to go through this all over again? Do we? The one that for once understood what is to recollect is kept for all eternity prisoner of just one and ever the same way to recall. E Agora? Lembra-me is an enigma starting with the title. It deals with that doubt that goes along with the proceedings of remembering. 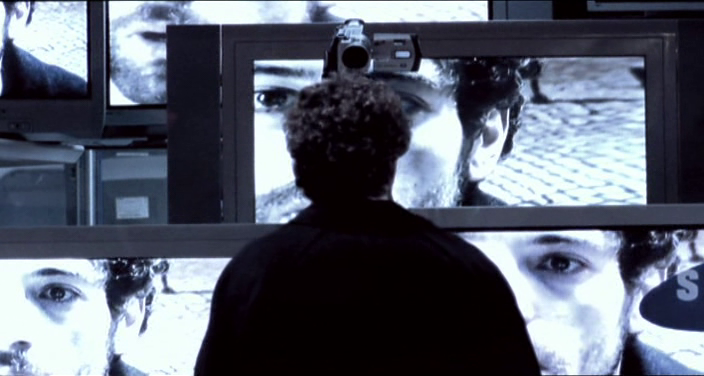 The title of Joaquim Pinto’s film hides at least three possible meanings (that may be lost in translation): Lembra-me (remind me) as one asking himself – and his mind – to make a better effort to remember; Lembra-me (remember me) as one asking to be remembered by other after leaving; and Lembra-me (recall me) as one looking forward asks to those accompanying him to refresh the chosen path. Joaquim is fond of these multiple readings that the Portuguese language conveys since they all are in a way true to the film. By embracing the matter of the film’s title and the subject of memory, directing an auto-biographical film is in a way to oblige one’s memory to look at a certain period (in this case between 2011 and 2012 – the duration of Joaquim’s experimental treatment for HVC in Madrid which is the film’s leitmotiv) through the eye of what a camera saved. Maybe both Joaquim and Nuno Leonel (his husband and life partner) are at risk of being “kept for all eternity prisoner of just one and ever the same way to recall”. But if looking at the past is filtered by such a beautiful film as E Agora? Lembra-me then that memory’s rewriting may not so bad after all. Besides that there is an enormous variety of tones in E Agora? Lembra-me, the religious film, the kino-diary, passing through the political essay and the more traditional scientific documentary. The political tone is present in the way the film shows how two men can be a couple and live together, how one can live with the HIV and the HVC virus, how these diseases are nothing like chronic infections and that living with them is not easy nor peaceful – as some start to consider with the development of new and better drugs. This is a fundamental way to read the film, and besides that it something that the director wanted, “I had some things I wanted to say (most of them were cut off in the final editing) and one of them was to show people that one does not live well with AIDS or HVC , much the opposite, but more important than that is to start talking again about a subject that is no longer so talked about”. In this way there is an interest in Joaquim Pinto’s cinema for filming the unseen. For instance, O Novo Testamento De Jesus Cristo Segundo João (The New Testament of Jesus Christ According to John, 2013) deals strongly with faith which is, by definition, believing in something that cannot be explained nor be shown – the text ends with an homage to those who, unlike Saint Thomas, believed in Jesus’ sanctity without seeing the wounds (see to believe/ver para crer said the saint; and Joaquim says in E Agora? want to believe/querer para crer). The film turns black, leaving us only Luís Miguel Cintra’s voice, since only without images one can look at the unseen. In the same way E Agora? tries to give image to something that has none (not even shape of color): a virus. Through this, one reaches the scientific and informative tone when, in a naife way, Joaquim goes to a virologist laboratory in search of a way to build a visual target for his (un)resignation (or when he films to the point of faintness body parts plaster models deformed by old illnesses). Another thing which Joaquim Pinto and Nuno Leonel’s cinema is undoubtfully connected with is literature. Their films are filled with quotes: Ruy Belo opens E Agora? ; Mário Cesariny ignites Sol Menor (2007); Dario Fo offers the title to Archangels Don’t Play Pinball (2014) – film composed of quotes by Alberto Caeiro (on of Pessoa’s heteronyms), Gottfried Wilhelm Leibniz and others; not forgetting Fim de Citação (End of Quote, 2013), a film about a theatre play made of exerts of various plays that Cornucópia Theatre Company brought to stage in the past 40 years; or even the already referred O Novo Testamento (besides all the musical and visual quotes – in E Agora? one can find for instance some references to the films in which Joaquim worked as sound director). These elements may work in a structure of building blocks – the film’s backbone – but also as additions, tangencies on the way of the (more or less) epic stories that they always seem to tell. Joaquim Pinto explained that “if there is one thing that I have learned with João César Monteiro (only one?) that is one must not be afraid of quotations, one has to accept and be proud of them”. If that is so, this directors’ work shows us how unafraid he is of his references. Still concerning an overview of Joaquim Pinto’s work, sometimes his films are divided between a first phase, as a fiction director, and a later phase with several documentaries and other objects more difficult to classify. I propose other division. If we want to keep with the binary understanding, instead of separating fiction from documentary maybe we should separate the sea and wind films from those of fire and earth. So notice, in the first category we would see films like Rabo de Peixe (2003) – dedicated to the life of a village of fishermen -, Surfavela (1996) – on a social integration project in Brazil that rescued kids from the favelas with surf – ou Uma Pedra no Bolso (1988) – a fiction film made of beach, sea, sun and summer love. On the other side we would have films like Onde Bate o Sol (1992) – about small minded people from the interior of Portugal and the forbidden love between a young boy from Lisbon and a rural worker –, Das Tripas Coração (1992) – the fire-film from a television series dedicated to four elements on the incestuous romance between two firefighters – and also E Agora? Lembra-me – that deals ever so often with the dry lands and the forest fires. And if we wanted to find an authorial recurrence in Joaquim and Nuno’s work it would have to be the physical work: from the hoe in Onde Bate o Sol to What now?, the fish line in Rabo de Peixe, the wooden spoon in Com Cuspe e Jeito se Bota no Cu do Sujeito (1998), and so on. But probably more important is the way this is understood in E Agora? when cinema itself is seen as a physical labor, a strength exercise, an artisanal work, something as close to daily life as watering the plants. Back to the film we are about to see, there is a scene in E Agora? that seems to me as one of the most beautiful that any cinephile can see: Joaquim is in his room in almost total darkness and his voice tells us the story of himself as child when, one day after school, little Joaquim decided he should die. He lay in bed, closed his eyes and imagined himself abandoning his body and leaving. But maybe for some superior interference, maybe for a noise outside that sounded more present, little Joaquim’s eyes opened and due to a small perforation in the curtain, he saw on the opposite wall an inverted projection of the outside world. An accidental camera obscura had been created, a kind of proto-cinema. Marveled by the discovery little Joaquim would never want to die again. I ask myself if cinema is one of the reasons Joaquim Pinto has to keep going. It certainly is. His films are an example of how cinema can invade our lives, reshape them and give them new purposes. It also happens, for example, in Prima della rivoluzione (1964), when the only colored scene was the moment seen through a camera obscura – unlike in Joaquim’s where he thought the projection was in black and white – when all truth could be said since a projection does not respond (nor even listens); or in Andrei Rublev (1966)’s forest cabin projection that renews the way one looks at nature. E Agora? Lembra-me is also one of the most touching love letters the film as ever written. How many films are there (and for that matter, how many directors, artists, men and women are there) capable of looking at the creation of the world by Francisco de Holanda, aetatibus mundi imagines, and find in-between the words that originated the universe, “Nuno” and “Love”? It’s as if Joaquim and Nuno’s love story had already been written, even before the existence of light or matter or anything at all. If this is not the most genuine form of love expression then I do not know what loving someone is. Le réel doit être romancée pour qu’on puisse le penser. When the German Thomas Harlan came to Portugal and decided to film Torre Bela (1977), a film about the popular occupation of the homestead with that name, one could say in a certain sense that he was following his father’s footsteps. If his progenitor, Veit Harlan, became a sort of an official filmmaker of the Nazi regime, the son, an oedipal rebellious, is seen today as an official filmmaker of the Carnation Revolution, or at least of the PREC period, the “Ongoing Revolutionary Process” after the coup d’état of 1975. A piece of militant cinema that José Filipe Costa decided to inquire in 2002 with Linha Vermelha, a film thesis presented in the Royal College or Art in London. This political and cinematic inquiry wanted to ask a few questions. If Torre Bela marks the public and historical image of April 25th (date of the Carnation’s Revolution) how did the film get made? What really happened in the period of class struggle in that Ribatejo homestead? How is Harlan’s film an activist gesture that changed the course of History? How does History depend and is affected by the nature of its filmic testimonies? What is the true nature of a documentary? All of these interrogations show – together with the heterogeneous articulations of elements in the editing of Linha Vermelha – its essayistic dimension. This is always in search of another “essay”, or more what we could call a “practical attempt”: a passage from ideology to reality, to a practical attempt of putting all those ideals in place by managing a cooperative of workers that had to give up their boots and working tools in favor of a trial version of a new society inspired by the revolution. The dialogue that José Filipe Costa establishes with Harlan and his film shows us spectators that his search is one of identity. In which way is Linha Vermelha invading curiously, pedagogically, the territory of Torre Bela? In which way might the first film “represent” the group of rural workers that patiently wait at the doors of the house to invade the rich people’s mansion, that is to say, to touch, like cinema does, the sacred? However, there is no sacred in terms of what can be done in cinema, and that might be the reason why we immediately learn that Torre Bela is not just a film and Thomas Harlan is not just a film director. He wanted to take part in the revolution, (“the presence of the camera was important to the success of the occupation”, Harlan states) and in that way he would chase the events, provoke them, reorganize them, add a little dramatic flavor now and then. But as we (and John Ford) know “when the legend becomes fact, print the legend”. If one might find charming to state that to revolutionize and film in the same gesture is something noble, what José Filipe Costa is after is the conscience of this idea that all legends are constructed facts and all facts might become legends. In the meantime, Wilson, the hero of Torre Bela, is seen through our eyes as if through a post-ironic filter. Perpignani, Harlan’s film editor, helps us to transform his dramatic speech to the masses into a rhetorical exercise fuelled by alcohol and sweat. Or the words of the film producer that transform the helicopter arrival of a general of MFA (Movement of the Armed Forces), with his low-key voice, sunglasses and cigarette dangling in the corner of his mouth into a heroic Bogart figure of an espionage thriller, descending from the skies. All this interplay of dramatic elements that jump from one film to the other, transformed in that step in their exposure value, culminates with the way Costa films Wilson in the present. He is also asked by the director to re-enter his room exactly as it happened in 1977 when the sound of Torre Bela proved that “la prise du pouvoir” was staged for the camera to record it. Now Wilson says that “he decided to be an actor of his own life”, when the acting career was nothing but a dream that faded away. What Linha Vermelha shows is that all people are actors in their own life and that questioning History and the past is also to question the veracity of its documents and to understand that veracity is always an interplay between facts and mediums as messages between people and the performative dimension of power dispositifs that surround and capture them. In this way, the moment when the voice over narrator says that it’s time to create a scene, he’s making explicit the manipulative power of cinema, and documentary dispositive in particular. If it is not by chance that Wilson, when recounting the taxi episode, says that he “created an image” to trick the driver. Or even the images of destroyed bullock carts that at a distance looked like cannons. If platonic images carry a suspicious dimension of the false, the documentary, on the contrary, helps the “illusion that all reality is on the screen”. But what about all the aspects of the occupation that Harlan didn’t film? Costa gives us those images and, as we are discovering more and more, as a mystery being solved about Torre Bela, he too is creating his drama. The exposure of the pretense objectivity of documentary (and more largely of cinema) is shown by digging the “fiction and dramatic” elements in Torre Bela and by calmly displaying those in Linha Vermelha. For this reason and the way it shows the insides of the cinematic dispositive – the editing table, the filmstrips, the “image of the sound”, as well as through the slow motion, the repetitions, the distorted sounds, the freeze frames – it’s hard not to consider the film itself, in its auto reflexive nature, a manual on how to do a documentary tout court. By exposing its manipulative nature, Linha Vermelha is saying that all films are fictions and fiction is the only way we have to access and think about what we commonly call real. The power of cinema is the one of “taking the imagination further in order to transform life”. It is under the fabric of imagination and fiction that the red curtains of History are being temporarily closed. Dead roses. Are dead roses real? The shot with which José Filipe Costa opens his film ironically resonates with its closure: the flowers at a dying man’s room table at a hospital in Switzerland, but also the symbol of a revolution that worn out. If Torre Bela is a document of a practical project for a possible different society, Linha Vermelha widens its possibility by showing the actors and spectators of a once adventurous and idealist community all sitting down like those wrinkled roses – no smiles or farming working tools on sight – watching a Lloyd Webber’s Cats performance in a local theatre. In the passage from adventure to drama, this is a scene about the failure of idealism where the figural symbol is a crowd of old people, not actors any more, but extras of a once glamorous show. Extras in art? In life? That doesn’t matter much, but, if I would take a guess, I would say both. How can we locate Tabu in this reflection? Well, the question is wrongly asked. Where does Tabu come from in order to arrive here? Ok, now we can start answering. Before anything else, it comes from Miguel Gomes’ world. You could say that this world has something to do with Wes Anderson, thinking of his exquisite taste for small things, for miniatures of the world that are playthings in the hands of childlike grownups or grown like children. You could say that Gomes isn’t immune to what I would call “the Apichatpong’s mania”, namely in his taste for the fey world of Nature which, it must be noted, is by no means incompatible with the children’s imaginary, unless they don’t actually move in society like wolves, as Truffaut put it. You could say all that, and it is well said, mainly if for the first reference – Wes – you are mostly thinking about A Cara que Mereces (The Face You Deserve, 2004) and some of his best short-movies [Inventário de Natal (Christmas Inventory, 2000) above all]; or if for the second reference – Apichatpong – you have in mind his singing fascination for Saint Francis in Cântico das criaturas (2006) or, of course, for some magical animals that appear in his movies: the fox in Aquele Querido Mês de de Agosto (Our Beloved Month of August, 2008) and the crocodile in Tabu, which is romantically named Dandy, a parodical blink of a eye to one of the VHS idols of the eighties in Portugal: Crocodile Dandy. But putting aside the contemporary affinities, it must be said that Tabu is rooted in an old era. 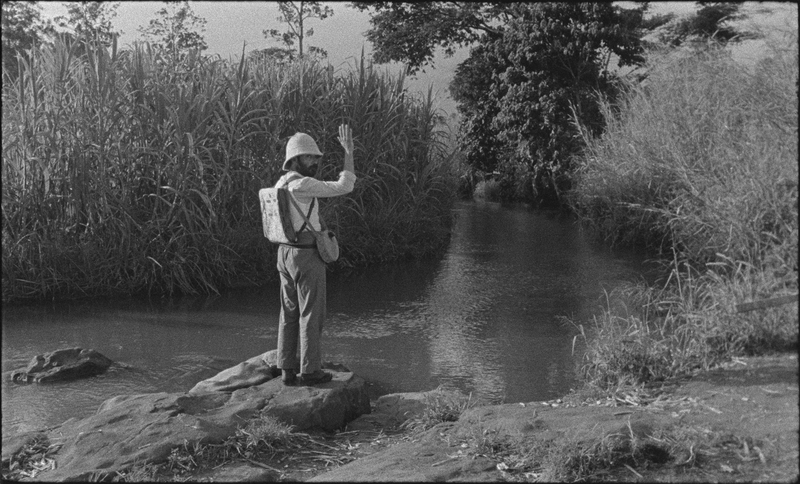 It is Miguel Gomes playing, as if he were a child, with the great tradition of silent cinema. It is not just the silent cinema that is quoted in recent successes like The Artist (2011) [and that is in a way mocked in the awful Kalkitos (2002), one of Gomes’s short movies], but that silent cinema that is resisting to the definitive broadening of sound. Gomes plays with references such as the homonymous movie by F.W. Murnau – the most obvious quotation – or with Josef von Sternberg’s Anatahan (1953), a movie completely narrated (by the director himself) but without any diegetic word. The narration is a fundamental figure in A Cara que Mereces – someone tells us a “bedtime story”… in a contemporary version of Sleeping Beauty and Snow White – and also here, in Tabu – Ventura tells his love story, where Aurora and the mythical landscapes of Africa share the protagonism with the mountain Tabu. In these two cases, we have two narrations that have a very similar structural division. First of all, we have the presentation of the characters in a world that masks the past – Francisco and his girlfriend in A Cara que Mereces and Pilar, Aurora and Santa in Tabu. After that, the two movies dive into fantasy. In the first movie, the past of those characters are of little importance, so the cut is more prominent than in Tabu, where its second part exorcizes and reveals, in black and white images resistantly silent, things that happened and that were asleep in the memory of the characters. In the narratives of A Cara que Mereces and in Tabu it is easy to detect the moment that separates the “before” from the “after” – Francisco’s chickenpox and the coffee with Ventura, respectively. The same doesn’t happen as clearly in Aquele Querido Mês de Agosto, where the reality of fiction gradually melts with the fiction of reality. Another thing connects structurally those two movies: they have the same dramatic telos, which is the “told story”, their alluring “Once upon a time…”. There are two separate parts clearly distinguished and the first one is there to stumble or vaporize itself in the second one. The second part of Tabu (Paradise) is the one that captures our attention and mesmerizes us intensely. Aurora’s story and his extramarital romance with Ventura in a dreamt, recalled, imaginary Africa are the powerful elements of a kind of poetic prose between fiction and non-fiction. The play with sound – that we don’t hear – of words and other sounds – that we do hear – of the surroundings is like the sequel to the scene in which Vasco Pimentel, the sound designer in Aquele Querido Mês de Agosto, complains that the sounds he is registering belong to another place. In Tabu, the sound of the surroundings – for instance, the music played live – overmatches or nullifies the sound of the diegetic word. Also, in Murnau’s Tabu, which could have been a sound movie – i.e. it didn’t need to be silent, it wanted to be silent – the word was in the things that were shown (like a letter, for instance). Murnau rejected the use of text separating the scenes. Miguel Gomes doesn’t reject the spoken word, but its sound is a prerogative of the narrator – Ventura in the coffee shop, today. What makes this narration so mesmerizing and not just one more tool of storytelling is this collage of silent and non-silent images that rescues imaginary landscapes of a legendary Africa from oblivion. If in A Cara que Mereces the narrator reads a book to some invisible children – the movie is divided into chapters illustrated with some child like drawings -, in Tabu the narrator narrates as someone who reports a story following the pages of an old photographic album. This explains the silent sounds and the “photographic” black and white photography, which appears almost as if eaten by time and moths, almost in the verge of extinction. However, these two objects – the child’s book and the photographic album – don’t have a factual existence in both movies. They don’t exist but they still structure the two movies, they are their conceptual backbone. Of this non-existent existence remains the idea of flipping through these stories, like you do with a book. In A Cara que Mereces or Tabu, the (second part of the) story ends in suspension, without returning to the starting point – that point which breaks the narrative structure in two -, without dematerializing the dream, without cleaning the dust and putting the old book back on the shelf. The wonderment in Miguel Gomes resides also in this image that wasn’t shot; in this magical insistence on the idea that the abracadabra of cinema must resist against the reality of the screening room and gently rock our lives at least while we are there. Therefore, Tabu is a spell that cinema casts over and for the sake of our lives. 48 is a movie about the memory of the endurable dictatorship lead by António de Oliveira Salazar in Portugal, which is commonly called Estado Novo. A memory that is lit up by this very direct confrontation between signs of the present (offscreen voice) and signs of the past (the frozen instant in an anonymous jail photography). The past opens a wound in the present as the two signs coexist in the movie. Ex-political prisoners talk about their past selves as victims of the physical, psychological and moral tortures that were perpetrated by the political police PIDE/DGS. The sound is the first presence in the movie. We hear the noise of heavy breathing, of a mouth salivating audibly, we sense there is someone alive “beyond the darkness”. From the murk, we see a face appearing in what is clearly a very old photo made during an imprisonment. The voice now talks and tells the story of that portrait. The camera moves very quietly towards the photo or, as it will also happen, along the photo. It is as if we are enclosed in the space of that fixed image, surrounded by darkness, in order to fill the gap of its anonymity. The voice speaks through the photo. The photo reveals, almost in a photographic kind of way, the memory attached to it. Other photos will come and with them we will witness the same process of revelation. But why is that the darkness still punctuates this succession of phantom-like apparitions? The dark screen in 48 is, quoting a more recent movie by Rithy Panh [L’image manquante (2013)], the image that is lacking. What lacks in the collective memory of Portuguese people is the real extent of the terror and violence that political prisoners suffered under Salazar’s rule. The first thing that 48 does is an apparently simple gesture of resistance: it lights up the darkness. It does so when it reacts to oppression and suppression by instituting a new regime of image and sound that gives a face to the faceless existence of people that opposed the establishment underground. Susana de Sousa Dias wrote a PhD dissertation entitled Abrir a História: a Imagem de Arquivo e o Movimento Desacelerado. Um estudo teórico-prático a partir dos filmes Natureza Morta e 48 (2013). In it she gives a detailed account of the whole process of making 48, starting with her main motivations. She acts upon the fact that those photographs were being ignored as main sources of information: “These are millions of anonymous women and men, with no kind of political protagonism and whose name no one recalls, but with a face that reveals us an aspect of the action of the political police that no written document can clarify”. The memory of the political prisoners is, then, imprisoned in those old photos stored and forgotten in an archive, which is “a place where we save the presence of absent things”, writes Susana de Sousa Dias. This dualism between presence and absence is not just a question of material proof. The photos are there, brought from darkness to the light of day, but there is still another variable: nowadays what does a man or a woman recall of that moment, after spending his or her years of freedom trying to forget? 48 has in its back another number: 36, the time during which the democratic Portugal was built over the wreckage of a depressed and impoverished nation. The photographs speak out for the 48 years of life under the harshness and abuses of Salazar’s dictatorship, but the victims speak from another point in time. Between the two there is this gap of multiple dualistic spaces: presence/absence, present/past and, most importantly, recognition/non-recognition. The whole movie, as the director also explains in her PhD dissertation, oscillates between states of recognition and non-recognition. In other words, 48 is not just a movie about recalling or recognizing, but mainly about not recalling or not recognizing. This non-recognition is sometimes heroic. One man explains how he subverted the photographic mechanism of recognition by always posing the same awkward face. He said that “they” could photograph, but he still had the freedom to choose his face. 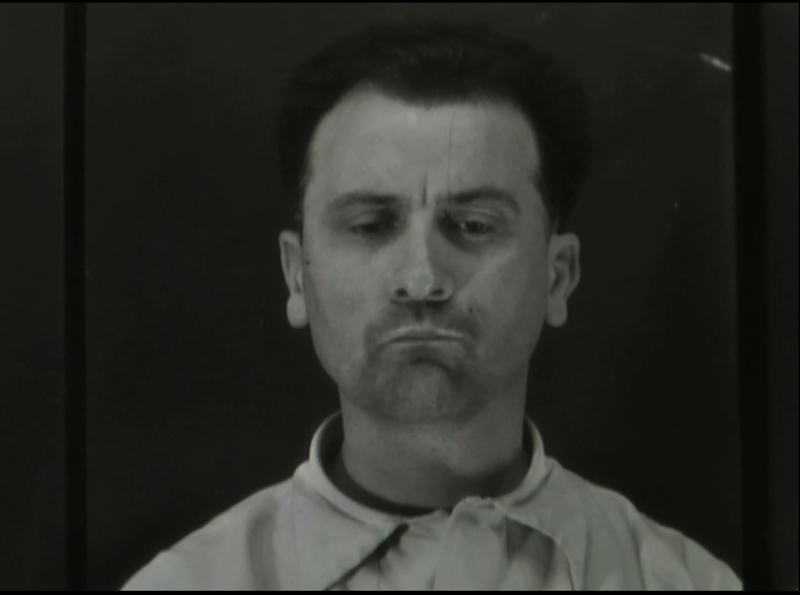 Being an anti-fascist resistant, he chose to “deform by mockery” that process identification in jail. Another girl describes the “silly smile” that she had on her face after being released from jail. It was a proud smile celebrating the fact that she was by then one more member of her family imprisoned by the hands of PIDE agents. She also remarks something about the way people related to each other back then. “The language was very much captivated. (…) We have to discover the truth of this Portugal by minimal gestures. We were old, I think. Very old. There weren’t any children, nor youngsters. We all had the same age, we all had masks”. Two things here: firstly, a truth that is enlightened only through minimal gestures is an idea that governs the whole movie in its own formal device; secondly, if the photograph is a mask of time, as André Bazin wrote, those old photos are “masks of masks”. “That face there wasn’t my face outside”, says one of the women. Another man states: “That isn’t my mother. It’s not her face”. 48 is a story of deformations, of faces that don’t belong to anyone. Ultimately, it is a picture about a lack of recognition. The underground but also the authoritarian forces of the regime worked out these ways of non-recognition. After being tortured, the prisoners became unrecognizable even to the eyes of loved ones. Even, I must add, to their own eyes. One of the male prisoners tells that, after being deprived of sleep for several days, he didn’t recognize his face in the mirror. We can also go further and state that these 48 years under a regime that perpetuated non-recognition had a tremendous effect in the way we sometimes, here in Portugal, tend to forget “who was who” back in the old days. Who was the terrorist – a word very much used in the African colonies to name the regime’s opponents – and who was the terrorized? And in what ways was the victim terrorized? If there is a face of that Portugal it is still a deformed one. One of the women says that after the revolution she attended the trial of some of the police agents that tortured her. She was astounded to feel that they were being treated as victims. Rescued from the darkness, the collection of shots of 48 recalls us the horrifying face of the executioner, even if he is, unlike the previous movie by Susana de Sousa Dias Natureza Morta (Still Life, 2005), the only one that remains offscreen- the executioner has or is the obscene face here. It is precisely in those intangible areas of memory where the face of the victim becomes unrecognizable that we most clearly see and identify the face of 48 years without freedom and without dignity. 48 years without children.